TRENTON, N.J. - (March 24, 2014) - Tektite Industries continues to augment their line of market-leading strobes and signaling devices with the unveiling of the Tektite M1 Strobe. 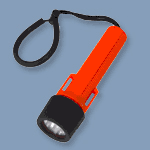 The Tektite® M1 Strobe (http://www.tek-tite.com/proddetail.php?prod=M1_STROBE) is a high-intensity, pocket-size LED emergency strobe beacon. It takes the best aspects of the Tektite® Mark-Lite® series and the Tektite® M3 Strobe to create a compact, high-intensity LED strobe that is perfect for emergency location marking use. The M1 Strobe is incredibly compact and reliable; boasting a lamp life of 10,000+ hours and using a simple twist-on, rotary switch for activation. This double O-ring sealed, waterproof strobe has a depth rating of 1,000 feet (333 m) and will run for over 50+ hours on a fresh set of two 3.6v 1/2AA-size Lithium batteries. Optional lens colors are available and a bungee wrist lanyard is included. The new Tektite M1 Strobe is available now direct from Tektite. For more information on the M1 Strobe, other new products from Tektite, or to place an order, visit our website www.TEK-TITE.com. 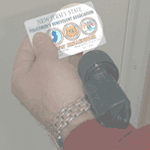 TRENTON, N.J. - (March 18, 2014) - The Tektite® Strobe 200™ was already considered one of the best signaling devices on the market. Now, Tektite Industries is proud to announce the upgrading of their most popular selling strobe, the Tektite Strobe 200, to a high-intensity LED strobe. The Tektite Strobe 200 (http://www.tek-tite.com/proddetail.php?prod=STROBE_200) now features a high-intensity 7-Watt LED module which boasts improved flash rate, lamp life, and durability compared to the previous Xenon version. Since it utilizes an LED strobe module, there are no fragile glass tubes to break such as in Xenon strobes, improving durability. The initial flash rate, with fresh batteries, has been improved from 50-60 flashes per minute to 120 flashes per minute (2 Hz). The lamp life has also increased from 1,000,000 flashes to 36,000,000+ flashes (10,000+ hours). Optional lens colors will still be available for the new Strobe 200. All of these upgrades have also been made to the Tektite® IR Strobe 200™ (http://www.tek-tite.com/proddetail.php?prod=INFRARED_STROBE_200). The new LED modules (http://www.tek-tite.com/proddetail.php?prod=STROBE_200_LED_Module) are backward compatible with previous Strobe 200 models. The new Tektite Strobe 200 is available now direct from Tektite. For more information on the new Strobe 200, other new products from Tektite, or to place an order, visit our website www.TEK-TITE.com. TRENTON, N.J. - (March 13, 2014) - Tektite Industries is proud to announce sweeping LED upgrades to many of their flight ops products including the ELZ Strobe, ELZ Kit, Mini ELZ Kit, and their infrared equivalents. The Tektite® ELZ Strobe (http://www.tek-tite.com/proddetail.php?prod=ELZ_Strobe) now features a high-intensity, multifunction 10-Watt LED strobe modules which help provide 5 times the battery life, 10 times the lamp life, better visibility range, improved flash rate, and twice the ruggedness of the older Xenon version. Previously based on the Tektite® Strobe 200, the ELZ Strobe is now based on the popular Strobe 3500 (3 C-cell Alkaline) to power the new LED strobe module. The multifunction LED strobe module can be used in flashing mode or steady mode and mode switching is done via a simple, reliable rotary switch so there is no fumbling around in the dark. This completely watertight strobe still utilizes the same weighted, spring-loaded base that keeps the strobe upright on all surfaces even in heavy winds and rotor wash. Optional lens colors are still available. All of these same upgrades have also been made to the Tektite® IR ELZ Strobe (http://www.tek-tite.com/proddetail.php?prod=Infrared_ELZ_Strobe). The Tektite® ELZ Kit (http://www.tek-tite.com/proddetail.php?prod=ELZ_KIT) includes these new strobes and they are now packed in a rugged Nanuk 945 equip case. The ELZ Strobe still folds flat for easy storage. These same changes have also been made to the Tektite® IR ELZ Kit (http://www.tek-tite.com/proddetail.php?prod=Infrared_ELZ_Kit). The Tektite® Mini ELZ Kit (http://www.tek-tite.com/proddetail.php?prod=Mini_ELZ_Kit) has also been upgraded to LED which boasts improved flash rate, lamp life, and durability compared to the previous Xenon version. The strobes in these kits now feature high-intensity, 7-Watt LED strobe modules which are far more durable than their Xenon predecessors since there are no fragile glass strobe tubes in these modules. The Mini ELZ Kit still features the same rugged backcountry case, ground stakes, and the availability of optional lens colors. All of these same upgrades have also been made to the Tektite® IR Mini ELZ Kit (http://www.tek-tite.com/proddetail.php?prod=Infrared_Mini_ELZ_Kit). These improved Flight-Ops products are available now direct from Tektite. For more information on Tektite’s improved Flight-Ops products, other new products from Tektite, or to place an order, visit our website www.TEK-TITE.com. TRENTON, N.J. – (December 4, 2013) - Tektite Industries, Inc., a worldwide leader in LED flashlights, strobes, and other portable lighting technologies, is proud to announce their first ever multifunction, high-intensity, all-improved LED strobes: the Tektite® Strobe 3500 XL Expedition, Tektite® Strobe 3500, Tektite® M3 Strobe, and the TEKNA® Lite 6 Strobe. All of Tektite's new high-intensity LED strobes now feature dual-function modules. These modules have two modes: flashing and steady. Use flashing mode just like a normal strobe. Use the steady mode for area lighting, as a backup light, or as a marker light. These strobes feature blistering, high-intensity LED strobe modules that are even brighter than Tektite’s already market-leading Xenon strobes. The lamp life of each of these modules is 10,000+ hours so they will seldom, if ever, need replacement. Even the durability, already a hallmark of Tektite products, of these strobes has been improved since these LED strobes do not utilize the fragile glass strobe tubes used in Xenon strobes. The Tektite® Strobe 3500 XL Expedition (http://www.tek-tite.com/proddetail.php?prod=Strobe_3500_XL_Expedition) is the brightest, most rugged, and shock resistant strobe we or anyone else makes. This multifunction, high-intensity LED strobe is visible for several miles (with a clear lens, conditions permitting) and flashes at initial flash rate of 120 flashes per minute (2 Hz) which is twice as many flashes per minute than our previous Xenon strobes. Along with our new multifunction LED module, this strobe features a battery housing that is computer machined from a solid bar of aircraft aluminum strong enough to be run over by a tank. Waterproof with double O-ring seals, the Strobe 3500 XL Expedition is dive rated to 2,500 feet (770 m) and will run for 100 hours in flashing mode (or 20 hours in steady mode) on a fresh set of three C-cell Alkaline batteries. The Strobe 3500 XL Expedition is also offered in an infrared (IR) version for government and military use (http://www.tek-tite.com/proddetail.php?prod=INFRARED_STROBE_3500_XL_EXPEDITION). The Tektite® Strobe 3500 (http://www.tek-tite.com/proddetail.php?prod=STROBE_3500) is the polymer version of the Strobe 3500 XL Expedition and is crafted from the same durable ABS and LEXAN® as many of Tektite’s other military-tough products. This multifunction, high-intensity LED strobe is visible for several miles (with a clear lens, conditions permitting) and flashes at initial flash rate of 120 flashes per minute (2 Hz) which is twice as many flashes per minute than our previous Xenon strobes. Waterproof with double O-ring seals, the Strobe 3500 is dive rated to 500 feet (150 m) and will run for 100 hours in flashing mode (or 20 hours in steady mode) on a fresh set of three C-cell alkaline batteries. The Strobe 3500 is also offered in an infrared (IR) version for government and military use (http://www.tek-tite.com/proddetail.php?prod=INFRARED_STROBE_3500). The Tektite® M3 Strobe (http://www.tek-tite.com/proddetail.php?prod=M3_Strobe) takes the best aspects of our Mark III series and Strobe 3500 to create a thin, rugged, powerful LED strobe that produces comparable light output to large Xenon strobes but without the fragile glass tubes. The M3 Strobe features a high-intensity, multifunction LED strobe module that is far brighter than the Tektite Mark III Strobe and about as bright as Tektite’s market-leading Xenon strobes but in a slim, three AA-cell Alkaline size body. 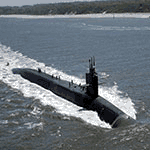 This strobe is crafted from the same durable ABS and LEXAN® as many of Tektite’s other military-tough products and is visible for 1+ mile (with a clear lens, conditions permitting) above water. Waterproof with double O-ring seals, the M3 Strobe is dive rated to 1,000 feet (333 m) and will run for 100+ hours in flashing mode (or 20 hours in steady mode) on a fresh set of three AA-cell alkaline batteries. 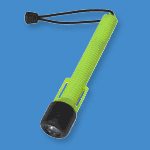 The TEKNA® Lite 6 Strobe (http://www.tek-tite.com/proddetail.php?prod=TEKNA_Lite_6_Strobe) is a rugged, multifunction, high-intensity LED strobe that is light enough to float! The Lite 6 Strobe, weighing only 0.5 lbs. (0.31 kg), is crafted from the same durable ABS and LEXAN® as many of Tektite’s military-tough products and sports our new multifunction, high-intensity LED strobe module. This strobe is visible for several miles (with a clear lens, conditions permitting) and flashes at initial flash rate of 120 flashes per minute (2 Hz) which is twice as many flashes per minute than our previous Xenon strobes. Waterproof with double O-ring seals, the Lite 6 Strobe is dive rated to 500 feet (150 m) and will run for 20+ hours in flashing mode (or 3 hours in steady mode) on a fresh set of two CR123A Lithium batteries. TRENTON, N.J. – (April 25, 2013) - Tektite Industries, Inc., a worldwide leader in LED flashlights, strobes, and other portable lighting technologies, is proud to announce an all-improved line of LED strobes: the Tektite Strobe 3500 XL Expedition, Tektite Strobe 3500, Tektite M3 Strobe, and the TEKNA Lite 6 Strobe. All of these strobes feature blistering, high-intensity LED strobe modules that are even brighter than Tektite’s already market-leading Xenon strobes. The lamp life of each of these modules is 10,000+ hours so they will seldom, if ever, need replacement. Even the durability, already a hallmark of Tektite products, of these strobes has been improved since these LED strobes do not utilize the fragile glass strobe tubes used in Xenon strobes. 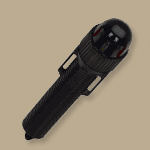 The Tektite Strobe 3500 XL Expedition (http://www.tek-tite.com/proddetail.php?prod=Strobe_3500XL_Expedition) is the brightest, most rugged, and shock resistant strobe we or anyone else makes. The Strobe 3500 XL Expedition sports a blistering 10-Watt LED strobe that is even brighter than Tektite’s already market-leading Xenon strobes and offers increased battery life over our previous 3 C-cell size strobes. This new strobe is visible for several miles (with a clear lens, conditions permitting) and flashes at initial flash rate of 120 flashes per minute (2 Hz) which is twice as many flashes per minute than our previous Xenon strobes. Along with our new LED module, this strobe features a battery housing that is computer machined from a solid bar of aircraft aluminum strong enough to be run over by a tank. Waterproof with double O-ring seals, the Strobe 3500 XL Expedition is dive rated to 2,500 feet (770 m) and will run for 100 hours on a fresh set of three C-cell Alkaline batteries. Optional colored lenses are available for the Strobe 3500 XL Expedition and it is offered in an infrared (IR) version for government and military use (http://www.tek-tite.com/proddetail.php?prod=INFRARED_STROBE_3500_XL_EXPEDITION). The Tektite Strobe 3500 (http://www.tek-tite.com/proddetail.php?prod=STROBE_3500) is the polymer version of the Strobe 3500 XL Expedition. This strobe is crafted from the same durable ABS and LEXAN® as many of Tektite’s other military-tough products. The Strobe 3500 sports a blistering 10-Watt LED strobe that is even brighter than Tektite’s already market-leading Xenon strobes and offers increased battery life over our previous 3 C-cell size strobes. This new strobe is visible for several miles (with a clear lens, conditions permitting) and flashes at initial flash rate of 120 flashes per minute (2 Hz) which is twice as many flashes per minute than our previous Xenon strobes. Waterproof with double O-ring seals, the Strobe 3500 is dive rated to 500 feet (150 m) and will run for 100 hours on a fresh set of three C-cell alkaline batteries. Available in a variety of popular body colors. 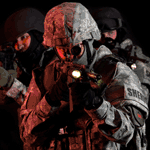 Optional colored lenses are available for the Strobe 3500 and it is offered in an infrared (IR) version for government and military use (http://www.tek-tite.com/proddetail.php?prod=INFRARED_STROBE_3500). The Tektite M3 Strobe (http://www.tek-tite.com/proddetail.php?prod=M3_Strobe) takes the best aspects of our Mark III series and Strobe 3500 to create a thin, rugged, powerful LED strobe that produces comparable light output to large Xenon strobes but without the fragile glass tubes. The M3 Strobe features a high-intensity 10-Watt LED strobe that is far brighter than the Tektite Mark III Strobe and about as bright as Tektite’s market-leading Xenon strobes but in a slim, three AA-cell Alkaline size body. This strobe is crafted from the same durable ABS and LEXAN® as many of Tektite’s other military-tough products. This new strobe is visible for 1+ mile (with a clear lens, conditions permitting) above water. Waterproof with double O-ring seals, the M3 Strobe is dive rated to 1,000 feet (333 m) and will run for 100+ hours on a fresh set of three AA-cell alkaline batteries. Available in a variety of popular body and lens colors (lens color is permanent). The TEKNA® Lite 6 Strobe (http://www.tek-tite.com/proddetail.php?prod=TEKNA_Lite_6_Strobe) is a rugged, high-intensity LED strobe that is light enough to float! The Lite 6 Strobe, weighing only 0.5 lbs. (0.31 kg), is crafted from the same durable ABS and LEXAN® as many of Tektite’s military-tough products and sports a blistering 10-Watt LED strobe that is even brighter than Tektite’s already market-leading Xenon strobes. This strobe is visible for several miles (with a clear lens, conditions permitting) and flashes at initial flash rate of 120 flashes per minute (2 Hz) which is twice as many flashes per minute than our previous Xenon strobes. Waterproof with double O-ring seals, the Lite 6 Strobe is dive rated to 500 feet (150 m) and will run for 20+ hours on a fresh set of two CR123A Lithium batteries. Available in yellow or black body color. Optional colored lenses are available for the Lite 6 Strobe. With the introduction of these new LED strobes, Tektite will be discontinuing two of its old strobe models: the Strobe 300 (http://www.tek-tite.com/proddetail.php?prod=STROBE_300) and Strobe 300 XL (http://www.tek-tite.com/proddetail.php?prod=STROBE_300_XL). While these models will no longer be manufactured or sold through Tektite, they are still supported for repair. For more information on Tektite’s warranty policy, please visit the “Ordering, Shipping & Warranty Information” page of our website (http://www.tek-tite.com/orderinfo.php). For those who already own a Strobe 300/300 XL and want to upgrade their strobe to LED we offer a drop-in, upgraded module (http://www.tek-tite.com/proddetail.php?prod=TEKNA_Lite_6_Strobe_-_Tektite_Strobe_3500-3500XL_Module). TRENTON, N.J. – (December 12, 2012) - Industry leader in innovation Tektite Industries, Inc. introduces the game-changing TEKNA® Lite 6, which boasts a powerful LED in a flashlight that is light enough to float. The Lite 6 is a huge step forward in the field of compact LED flashlights as it provides more light than lanterns five times as large and heavy. Weighing only about a half-pound and 5.7 inches long, the Lite 6 provides 240 Lumens of power from two CR123A 3-volt Lithium batteries. The Lite 6 utilizes specialized optics that produces an ultra-tight six-degree beam pattern that is great for cutting through smoke and fog. Constructed of durable ABS and Lexan® the Lite 6 is waterproof and, with its double O-ring seals, is depth rated to 500 feet (150 m). This flashlight makes for a great backup dive light with its 3-hour burn time or is also great for those who want a rugged, powerful light without compromising pack weight and size. TRENTON, N.J. – (December 12, 2012) - Just in time for the holidays, Tektite Industries, Inc. introduces the Ocean Edge™ Titanium Limited Edition Gift Box featuring a new take on a storied dive knife. This gift box features a TEKNA® Ocean Edge™ Titanium Limited Edition dive knife and a free TEKNA® Xtra Edge™ keyring knife in an attractive case for only $199.95. The Ocean Edge™ Dive Knife has always been a favorite among divers because of its versatile design and solid, one-piece construction. The Titanium Limited Edition improves on this classic, ever-popular dive knife by keeping it simple: take our proven dive knife and offer it in one of the strongest metals available. Each knife comes with a quick thumb release ABS sheath; quick release/adjust Velcro leg straps, and a belt clip conversion kit. Every knife is individually serial numbered and is carefully crafted by the most experienced blade maker in the USA. The Xtra Edge™ is a superb choice as a watersports, pocket, neck, or keyring knife. The blade is crafted from 420HC stainless steel to provide increased toughness, better edge holding, and is unobtrusively stored in a twist-loc sheath. The sheath/handle is made with TEKNALON CFTRP, our propriety fiber as well as Titanium reinforced engineering polymer to provide enhanced durability and strength. It includes a nickel-plated carabineer-type keyring. 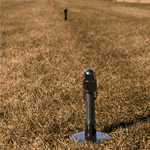 TRENTON, N.J. – (July 8, 2010) - Tektite Industries, Inc. provides pilots with even greater safety, functionality and ease of use when landing at underdeveloped runways with their now remote-controlled Remote Landing Strip Light and ELZ Light Kits. 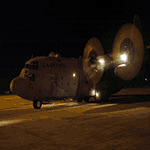 Useful for runways, drop zones, helipads and more, the Remote Landing Strip Light Kits allows turning on all applicable lights at the push of a button. 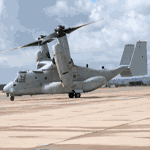 This upgraded ability allows expeditionary, improvised or temporary landing zones of any size to provide better landing circumstances for pilots. The remote control feature is the latest development in Tektite’s ELZTM (NSN 6230-01-524-9261 Standard/NSN 6230-01-532-0285 Infrared), and Landing Strip Light Kits, which are already in use worldwide by numerous agencies. 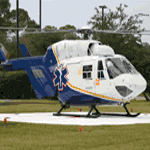 Remote landing strip lights are available in 40 and 10 light kits. The Remote Landing Strip Light Kit contains 40 lights that feature clear lenses, a 3,800’ strip along with a remote control in a wheeled, rugged carrying case. The Remote Landing Strip Light Kit Jr. contains 10 lights that feature clear lenses, a 900’ strip along with a remote control in a rugged carrying case. The Remote ELZ Kit and Helicopter LZ Light Kits come with a remote control and lights that feature red and blue lenses. The battery life of the remote products is about a week on standby and 25 hours of operation or two weeks on standby and 12 hours of operational use. All of the above kits are available in infrared (IR) versions to approved government agencies. TRENTON, N.J. – (June 21, 2010) - Tektite Industries, Inc. continues to push the envelope of landing light solution innovations by releasing their highly anticipated Landing Strip Light Kits. A further development of Tektite’s ELZTM Kits (NSN 6230-01-524-9261 Standard/NSN 6230-01-532-0285 Infrared), which are already in use worldwide by numerous agencies, the Landing Strip Light Kit offers a 40-light and 10-light solution kit that can be customized with additional lights for use in expeditionary, improvised or temporary airfields of any size. 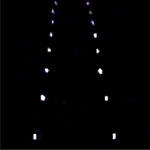 The Landing Strip Light Kit includes 40 Landing Strip/Runways Lights, which is enough to illuminate a 4,000’ runway if placed at typical intervals (maximum 200’ apart). The lights come packed in a rugged, wheeled, carrying case that provides ease for both storage and set-up. As few as two people can perform set-up of the kit in a few minutes. 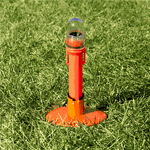 Tektite’s other offering for smaller runways are the Landing Strip Light Kit Jr., which comes with 10 Landing Strip/Runway Lights packed in a durable carrying case. The 10 lights included in the Light Kit Jr. are enough to light up a 900’ runway if placed at typical intervals (maximum 200’ apart). Available in the both visible and infrared light spectrum, these waterproof lights emit a powerful 43.4 Lumen white light generated from a 14-LED array. With three C-cell Alkaline batteries, it provides burn times of over 20 hours with a 10,000+ hour bulb life. Constructed out of ABS with a LEXAN® lens, these lights can stand up in high winds and propeller wash with their spring-loaded, vinyl-coated lead base, which also allows the light to fold up for easy storage. 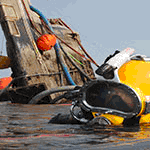 TRENTON, N.J. – (June 18, 2010) - Tektite Industries further cemented being one of the premiere LED technology and strobe makers in the world when thousands of Tektite LED marker strobes were chosen recently for safety marking use in the Gulf of Mexico oil spill clean up. The marker strobes are being set up to mark deployed oil booms that are protecting shorelines from the oil spill. 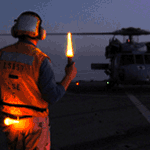 At night, the strobes provide navigational safety by alerting vessels of boom locations from significant distances. Tektite LED marker strobes beat out several other competing products based on Tektite products’ performance, price, as well as Tektite’s ability and readiness to deliver. TRENTON, N.J. – (Feb 24, 2010) – Tektite continues to demonstrate its leadership in the development of portable LED lighting solutions with the introduction of the new 10-Watt LED strobe, the Strobe 3500 XL Expedition. The Strobe 3500 XL Expedition utilizes a powerful 10-watt LED strobe secured within a rugged solid aluminum body, providing blinding strobe power at depths of up to 2500 feet. Powered by three C-cell alkaline batteries, this rugged diver’s tool will light up the ocean with 60 flashes per minute for up to 20 hours. With this new advance, divers now have a strobe that incorporates all the benefits of LED technology, including longer bulb life, higher energy efficiency, all within a rugged military-grade body. It can be seen for miles at night, and is already in use in scientific, military and firefighting applications. TRENTON, N.J. -(Feb 24, 2010) – Tektite Industries, Inc., the Trenton-based parent company of TEKNA, the beloved US-based knife and flashlight company, has taken to steps to resume full production of TEKNA’s longstanding line of knives and flashlights following the major acquisition of tooling equipment. The Xtra Edge™ - The same knife, just better. The Xtra Edge™ is a superb choice as a watersports, pocket, neck, or key ring knife. The blade is unobtrusively stored in a twist-loc sheath. Available in traditional or blunt screwdriver tip blade styles. TRENTON, N.J. – (July 22, 2009) - Tektite Industries, a leading Trenton-based lighting manufacturer, donated a shipment of bike lights to the Boys & Girls Club Bike Exchange in Ewing and both Princeton police departments last week for use in promoting bicycle safety. The equipment, which retails for around $20, features three high-intensity LED lights in a durable, shock-resistant case. Tektite also donated complimentary clamps to attach the lights onto bicycle frames and AA batteries that will allow the high-efficiency lights to flash for up to 500 hours. The Boys & Girls Bike Exchange refurbishes donated bicycles and resells them at low prices to children and adults who need them. Proceeds from the sales, which take place in a storefront in the Capitol Plaza in Ewing Township, fund work at the Boys and Girls Club of Trenton and Mercer County. Russ White, the Princeton resident who organized the program, said bike exchange workers plan to sell the 30-plus packages of Tektite equipment they received with bicycles to promote safety and generate more funding for the Boys and Girls Club of Trenton and Mercer County. The Princeton Borough and Princeton Township police departments received 20 lights each from Tektite. Corporal Geoffrey Maurer of the township police said he intends to distribute the lights to restaurant workers, often from the area’s growing Latino population. The department frequently encounters at night on roads like Route 206, where cyclists without proper lights or reflectors have been struck by traffic, according to Officer Maurer. Lt. David Dudeck of the Princeton Borough police said his department intends to distribute the lights to children and others at community events for use in promoting bicycle safety. TRENTON, N.J. - (February 1, 2007): Tektite Industries has announced that the U.S. Patent and Trademark Office awarded a registered trademark for their Tekna flashlights and knives. TRENTON, N.J. - (February 1, 2005): Tektite Industries has announced that the U.S. Patent and Trademark Office awarded a registered trademark for their Expedition series flashlights. TRENTON, N.J. - (November 9, 2004): Tektite Industries has announced that the U.S. Patent and Trademark Office awarded U.S. Patent No. 6,814,463. TRENTON, N.J. - (July 20, 2004): Tektite Industries has announced that the U.S. Patent and Trademark Office awarded a registered trademark for their Trek series flashlights. TRENTON,N.J. 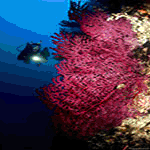 - (May 12, 2004): Tektite continues to demonstrate its leadership in the development of LED dive lights with their new 12-Watt L12 Seeker, the most powerful LED dive light in the world. The L12 Seeker utilizes three Luxeon III Star LEDs each operating at 4 Watts to produce 240 Lumens of blistering white light equivalent to 120+ regular LEDs, easily doubling the light output of the Trek 6000 EX60 and competing Luxeon VStar LED dive lights. A special tri-lens optic produces an ultra-tight 12-degree spot beam that pierces through murky water with minimal backscatter. 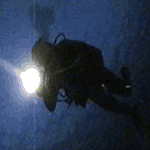 The L12 Seeker’s hot spot is surrounded by a large corona of light that gives divers excellent peripheral visibility. All divers will appreciate the benefits of the solar-quality (5,500K) white light produced by the L12 Seeker. This high-quality light drastically improves the visualization of color and contrast that is lost at depth, making the L12 Seeker an excellent choice of underwater videography and photography. Another benefit of the L12 Seeker compared to HID and Halogen dive lights is its extreme ruggedness. The L12 Seeker is no fragile light; it’s double O-ring sealed throughout, and is made from aircraft-grade Aluminum and high-impact grades of PVC and LEXAN®. In addition, its LEDs are virtually indestructible and last 10,000+ hours, so you’ll never have to worry about a bulb breaking or burning out again. This built-in safety feature makes the L12 Seeker a perfect match for the demanding needs of cave and technical divers. The L12 Seeker is powered by an advanced submersible battery system that delivers 4+ hours of burn time. Its NiMH battery pack is smaller, lighter and more powerful than other battery systems, and it has no cell memory, built-in thermal/high current protection, twice the charge cycle life and burn time of NiCad batteries, and the ability to withstand high charge/discharge currents. A Smart Trickle Charger is included with the L12 Seeker; this charger has a universal power supply that accommodates input voltages of 100 to 260 VAC at 50 or 60 Hz. 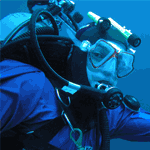 Divers will be able to configure the L12 Seeker to suit their preferences. 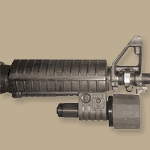 The battery pack can be belt, tank or BC mounted, while a quick-release pistol grip handle is standard equipment. With optional equipment, the L12 Seeker can be mounted onto most video and camera housings (a diffuser lens is also available). Divers can also request a permanent wide-angle tri-lens optic that makes the L12 Seeker into a super-wide floodlight. TRENTON, N.J. - (February 12, 2004): Tektite continues to demonstrate its leadership in the development of LED flashlights with the introduction of a new 4-Watt LED flashlight, the Excursion LS4. The Excursion LS4 utilizes the new Luxeon III Star to provide up to 80 Lumens of blistering white light. With this new advance, LED flashlight users now have along-lasting flashlight with double the light output of competing Xenon and Krypton three D-cell flashlights. Users will also appreciate the solar-quality white light (5,500 K) of the Excursion LS4, which provides improved color rendition and increased beam throw. In addition to being at the leading edge of technology, the Excursion LS4 has many standard features that complement its performance. 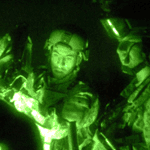 Burn time is 10+ hours with 10 additional hours of usable light, many times longer than “tactical” flashlights. Special narrow beam, 10-degree, optics allow the Excursion LS4 to cut through smoke and fog with ease. TRENTON, N.J. - (January 13, 2004): Tektite Industries has announced that the U.S. Patent and Trademark Office awarded a registered trademark for their Excursion series flashlights. TRENTON, N.J. - (August 6, 2003): Tektite Industries announced the conclusion of its lengthy patent and trade dress suit against multiple defendants said Tektite President Scott Mele. The suit, involving Tektite's U.S. Patent 6,168,288 for LED flashlights, succeeded in enforcing Tektite's intellectual property rights. "All defendants have either licensed our patent, or agreed to stop selling their infringing products. I consider this a conclusive victory in defense of our intellectual property rights," Mele said. The suit, in process for more than two years, was ended by Tektite after the last defendant agreed to stop production of their infringing products and to pay a settlement on prior sales and costs. TRENTON, N.J. - (August 2, 2002): Tektite Manufacturing announced today the launch of a new flashlight product for the airline industry... the Excursion Pro™ - 19 LED aluminum flashlight. The Excursion Pro™ was designed to meet the harsh demands of any emergency imaginable with features that separate it from anything else available. "In the process of engineering a flashlight that would exceed FAA requirements, we decided to take it a few steps further and develop the most durable flashlight in the world", explains Scott A. Mele, president of Tektite Industries. "Our mission is to be the portable lighting brand of choice for industry," continues Mr. Mele. The Excursion Pro™ utilizes 3 D cell batteries offering more than 10 times the battery life of regular incandescent flashlights. 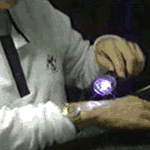 This is done in part through Tektite's patented LED circuitry. The LED lamps offer more than 10,000 hours of continuous life and are virtually impossible to break even in the most rugged use. Each flashlight is computer-machined from a solid bar of aircraft aluminum maximizing strength while double O-ring seals give it an underwater depth rating to 1,000 feet. "The trend we're seeing is that people are less concerned about price and more concerned about not cutting corners in emergency and safety applications. It's simply hard to put a price on feeling secure", comments, Richard Saint Cyr, vice president of Tektite Industries. TRENTON, N.J. - (June 10, 2001): Tektite Industries, Inc. has announced that it has initiated suit in the U.S. District Court in Trenton, N.J., against multiple defendants for patent infringement and for unfair competition based on trade dress infringement. Tektite is seeking damages and an injunction preventing the defendants from making, selling or importing LED flashlights in violation of Tektite's U.S. Patent No. 6,168,288 or in violation of the proprietary trade dress embodied in Tektite's TREK brand LED flashlight products. Tektite has initiated proceedings against Holly Solar Products, and other parties, including the dealers and distributors of the accused Holly Solar products, with the goal of defending its inventions and trade dress, each of which Tektite believes to have been blatantly copied by the defendants. The company is seeking treble damages and an injunction against further manufacture, import and sales of the flashlights in question. TRENTON, N.J. - (May 1, 2002): Streamlight has licensed Tektite's U.S. Patent No. 6,168,288 for use on Streamlight's Batonlite product. TRENTON, N.J. - (November 29, 2001): Lightwave has licensed Tektite's U.S. Patent No. 6,168,288.